Mr Gasket Pedal Pads UNIVERSAL - MiataRoadster - Stay tuned with MiataRoadster! 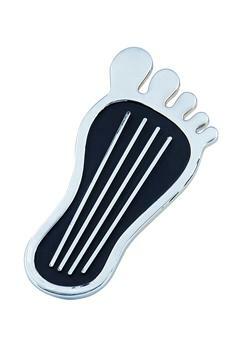 Add some fun to your car with this barefoot style gas pedal pad. Deep tread, long wearing pad with contrasting chrome grid. No drilling or alterations necessary. There’s nothing cooler than a gas or brake pedal shaped like a bare foot! Mr. Gasket’s original foot shaped pedal pad has a universal fit, for your street rod to your golf cart. Dress up or dress down your ride with this pedal pad. Chrome plated aluminum with black accents.